Developing children’s communication skills is one of the cornerstones of FasTracKids’ curriculum. The goal is if communication improves in the classroom, then the chance of making children even better students increases. Research shows that the average child misses 25% of what is being said in a normal classroom setting. That number can go as high as 40% in lost communication, depending on the classroom environment. So how can this issue improve? One way is to have a classroom sound system that can amplify the voice of a teacher as they speak. 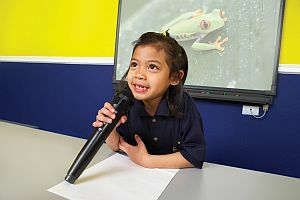 Ideally, there should be 2 microphones set up in a classroom; a standard, hand-held wireless microphone for students and a headset or lavaliere microphone for the teacher. A question that could be asked is why not use the single, hand-held microphone for everyone and just pass it to the students when it is their turn to talk? In return, this question should be asked: As a teacher, do you think it would be easier to manage a fun, dynamic classroom with one hand or two? Being able to use both hands while a lesson is amplified gives a teacher different options in running the class.